To find out what the correct pressures are for your caravan, refer to the handbook or use TyreSafe’s caravan tyre pressure calculator. Whatever tyres are fitted to the towing car, caravan, trailer tent or motorhome, it is essential to the safety and stability of the combination that all tyres are correctly inflated for the applied load. Tyres that are under-inflated are much more likely to suffer from a sudden rapid deflation which can cause loss of control of the vehicle. Any debris left on the carriageway will prove hazardous for other motorists and fitting of a replacement tyre on the hard shoulder of a motorway is a notoriously dangerous activity. Fuel costs can also be minimised by ensuring tyres are correctly inflated. When tyres run under-inflated their rolling resistance, or the force needed to make them turn, increases. This means that the engine has to work harder and more fuel is used, making the vehicle less economical. Pressures should be checked and adjusted when the tyres are cold before every journey. Never reduce pressures when the tyres are warm as they could then be too low when they cool down. After checking the pressure, ensure the valve is not leaking and a valve cap is fitted to each tyre. The correct inflation pressures for your car tyres can be found in the vehicle handbook, inside the fuel filler cap or on a plate located on the driver’s door sill. In the absence of special towing recommendations, the rear tyres of cars should be set at the ‘fully laden’ pressure. Where full load pressure does not differ from that for normal driving , the rear tyre pressures should be increased by 4 to 7 psi (0.3 to 0.5 bar). Appropriate inflation pressures for the actual load imposed on caravan and trailer tent tyres can be found by clicking Load and inflation tables. Special conditions apply to Self Supporting Run Flat Tyres where they are fitted to the towing vehicle. Guidelines for tyre pressures and conditions of operating in a run flat condition are given in the vehicle manufacturer’s handbook. Alternatively, use TyreSafe’s caravan tyre pressure calculator. The original tyres for a caravan are determined by joint consultation between the caravan and tyre manufacturers and take into account all aspects of operation. Any changes in tyre size or type should not be undertaken without seeking advice from the caravan or tyre manufacturer. In some European countries it is illegal to use replacement tyres which differ in certain respects such as size, load or speed rating, from the tyre originally fitted by the manufacturer. Older caravans may be fitted with cross-ply tyres that are no longer available, meaning that radial ply tyres must be fitted. If a caravan is converted from cross-ply to tubeless radial tyres, the latter must only be fitted to safety type rims, i.e. those with a hump or flat ledge on the outer bead seat. Many older caravans do not have safety type rims and the previous recommendation has been to fit tubes with radial ply tyres. Before doing so, the tyre manufacturer must be consulted, as not all radial ply tyres are suitable for use with tubes. When travelling abroad during winter months, some country’s laws require winter tyres to be fitted to the vehicle. Even if not required by law, it is still a good practice to fit tyres that are appropriate for the road and weather conditions. If in any doubt, contact your tyre manufacturer for further advice. It is essential that the combined tyre load capacity is sufficient for the maximum weight (MTPLM) of the caravan, but as an extra safeguard it is strongly recommended that the MTPLM does not exceed 90% of the tyre’s load capacity. Overloading tyres is extremely dangerous and should be avoided at all times. A poorly distributed load can also lead to overloaded tyres even when the maximum total permissible load is not exceeded. Loads should be spread evenly around the caravan and as low down as possible to maximise the stability and safety of the car and caravan combination. The police may take action against drivers who’s caravans are found to be overloaded or have a poorly distributed load. To ensure tyres are not overloaded, it is advisable to keep the caravan operating weight below the specified maximum limit. A 10% margin will partly help to compensate for some unequal load distribution. For maximum safety and reassurance regarding vehicle weight, use a Public Weighbridge to check the load. It is strongly recommended that a compatible spare wheel and tyre assembly is carried for the caravan. As caravan tyres and wheels are rarely the same as those on the towing vehicle, the spare tyre and wheel assembly from the towing vehicle must not be used on the caravan, even in an emergency situation. The caravan spare tyre should be the same size, load index and speed rating to those already fitted to the axle. When checking the pressures and condition of the tyres on the towing vehicle, remember to check the spare tyre as well. Adequate tread depth is vitally important for road safety. The tread grooves help to evacuate water from the road surface. If tread depths are not sufficient stopping distances increase, there is a higher risk of aquaplaning and vehicle safety is reduced. Furthermore drivers can face penalty points and fines if tyres are found with tread depth below the legal limit. To ensure compliance with tread depth regulations across Europe, a minimum tread depth of 1.6mm across the full tread width is recommended. In the interests of safety it is advisable to replace tyres before they reach this legal minimum limit. 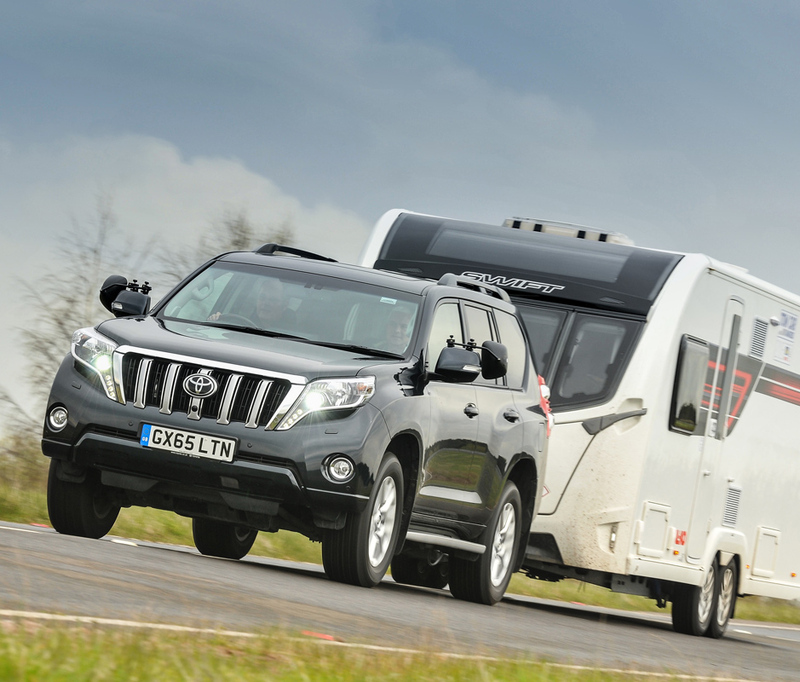 The National Caravan Council’s Caravan Towing Guide recommends that the noseweight should be varied to find the optimum for towing depending upon the actual laden weight of the caravan. Experience and research has found that the noseweight should be around 5% – 7% of the actual laden weight for optimum stability. However, this may be restricted by the towing vehicle manufacturer’s limit and the caravan’s hitch limit. If there is insufficient weight on the hitch the caravan may snake leading to instability and control issues. Tyres left on a stationary vehicle, particularly if parked in coastal areas, will suffer from ageing issues much more quickly than those in regular and frequent use. If possible, caravans left standing for any length of time should have their tyres covered to shield them from damaging UV rays and be jacked up to remove any load on the tyres. If you are in any doubt about the condition of your tyres, have them checked immediately by a qualified tyre specialist. Tyres are designed and manufactured to provide thousands of miles of excellent service. For maximum benefit, they must be maintained properly to avoid damage and abuse that may result in reduced performance or compromise safety. The service life of a tyre is dependent upon many factors which impact on it during its life and therefore accurately predicting the service life of any specific tyre in chronological time is not possible. There is no known technical data that supports a specific age for a tyre’s removal from service. However, in the interests of safety a number of vehicle and tyre manufacturers recommend that tyres (including spares) that were manufactured more than a certain number of years previously be replaced with new tyres, even if they appear to be useable from their external appearance and the tread may not have reached the minimum legal limit. It is recommended that any such manufacturer instructions should be followed.